A travel evening wedding invitation in a postcard style format. 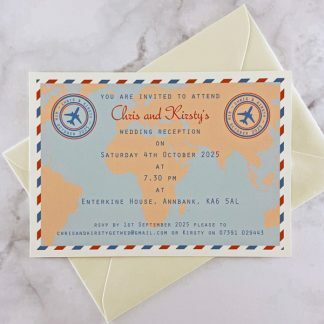 Ideal for an evening wedding invitation, engagement party invitation or anniversary party invitation with a travel theme. The Travel Ticket design has a map background and stripe border in the style of an airmail envelope. The logo has a plane, two names and the date of the party/event around the edge. 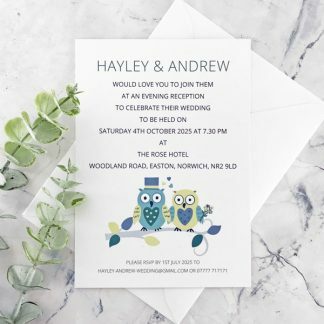 The design has a colour scheme based on two colours which you can choose these from the wedding stationery colour chart. Each of these travel themed evening wedding invitations measures 10.5 x 14.8 cm or A6 size. They are made from high quality white or ivory card with a smooth or textured finish. A co-ordinating white or ivory envelope accompanies each invite. The design is printed using fade resistant and smudge proof ink. The layout and wording will be personalised to suit your celebration details. I will send a jpeg picture of the design before printing so you can check everything. 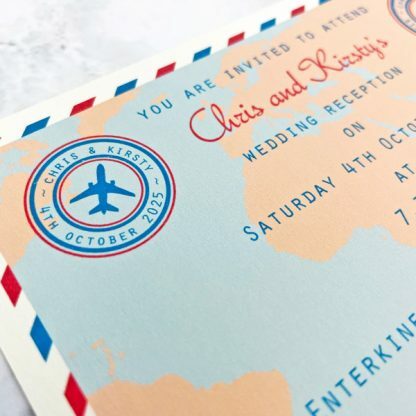 This travel themed wedding design is also available as a ticket style invitation with wallet – like a airline style ticket. 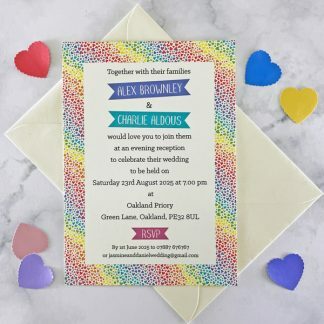 There is also a full range of co-ordinating stationery for the wedding day. You can view these on the Travel Ticket design page.